Only two cycling offences were recorded by police in Peterborough last year, of which only one led to a fine. The number of cycling offences in the city has dropped from 103 in 2014 when police handed out 41 fines. No cyclists were caught flouting the Bridge Street ban last year, compared to 53 in 2012, 43 in 2013, six in 2014 and five in 2015. The figures were revealed following a Freedom of Information (FOI) request by the Peterborough Telegraph. The FOI was submitted after figures obtained by The Times showed that the number of fixed penalties issued to cyclists in the whole of Cambridgeshire dropped from 831 in 2013 to 49 last year. The PT asked Cambridgeshire police why fines were not being issued despite Peterborough City Council leader Councillor John Holdich saying residents wanted them to be handed out. A police spokeswoman issued the same response as from the story on the Cambridgeshire statistics. She said: “As with all figures of this kind it’s very difficult to give one definitive reason. “One may be our priorities, which are safeguarding the vulnerable, burglary, anti-social behaviour, domestic violence etc and with finite resources we have to deploy officers in a way that tackles these areas most effectively. “So we may have taken officers away from proactively tackling cycling offences to dealing with the aforementioned crimes. “Also, we have had a ‘lights instead of tickets’ scheme for some years now where we take a more educatory approach and give people without lights a chance to get some lights and prove it, in place of getting a ticket straight away. 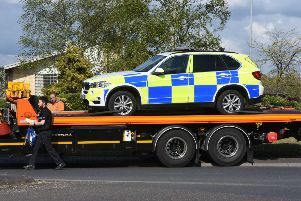 “Having said this, we’re not turning a blind eye, and any cyclists committing offences will be dealt with by officers in the most appropriate way.” The spokeswoman said cycling is not a top police priority. From April, the city’s SaferPeterborough Prevention and Enforcement Service - which includes police and council staff - can fine cyclists breaching the Bridge Street ban.